Osteoarthritis (OA) is a chronic disease in which cartilage breaks down over time, causing pain, inflammation and stiffness in the joints. It is by far the most common form of arthritis. Nearly all vertebrates suffer from OA, including porpoises and whales, and those long-extinct giants, the dinosaurs. Cartilage is the slippery tissue that covers the ends of bones in a joint, allowing the bones to glide over one another. It also absorbs energy from the shock of physical movement. 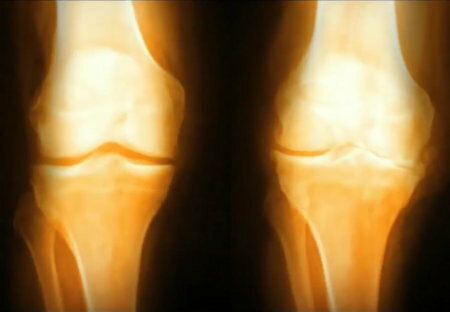 When cartilage in a joint deteriorates, Osteoarthritis occurs. There are two types of Osteoarthritis: primary and secondary. Primary OA appears without any apparent cause, usually as a result of aging. Secondary OA occurs in joints that have sustained injuries, or experienced infections or fractures. The pain of Osteoarthritis is often caused by ligament relaxation around the joint: old cartilage breakdown exceeds new cartilage synthesis, leading to loose ligaments and joint instability. Secondary OA can be caused by obesity (added pressure on weight-bearing joints), or as the result of another type of arthritis, such as rheumatoid arthritis. As the cartilage in a joint deteriorates, the bones begin to rub together, causing pain, swelling, and loss of motion of the joint. The joint may begin to lose shape. Small bone spurs called osteophytes may grow on the edges of the joint. Inflammation may or may not be present. The pain may come and go. These symptoms almost always begin gradually, taking years until the pain is severe enough to be reported to a doctor. OA is commonly found in the joints of the fingers, feet, knees, hips and spine, and is rarely found in joints of the wrist, elbows, shoulders or jaw. Although it is usually not difficult to diagnose OA, no single test can pinpoint the disease. Most doctors use a combination of patient history, physical examination and X-rays to diagnose the disease and rule out other causes for the symptoms. 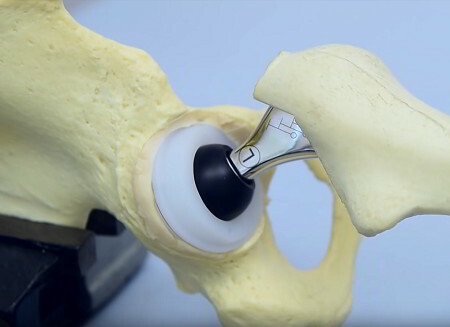 Hip and knee replacement surgery (arthroplasty) is a very common and successful procedure for those with joint damage and pain that interferes with normal activities. Treatment of Osteoarthritis should focus on managing pain while improving joint function by strengthening the joint and encouraging cartilage growth. This can be done in several ways. People in occupations or activities requiring repetitive and stressful movement should find ways to reduce joint trauma. Adjusting the work area, substituting tasks or changing exercise activities to produce less stress on joints can help reduce further 'wear and tear'. Corticosteroids are typically injected into affected joints rather than taken orally to relieve the pain, but repeated injections may further weaken loose ligaments and prevent healing which requires an inflammatory like response. Maintaining the structural integrity of the synovial joints is fundamental to osteoarthritis prevention. Osteoarthritis leads to rapid and complete breakdown of cartilage. Those affected have increased risk of developing bone death (osteonecrosis), stress fractures, bleeding inside the joint, gout, poor sleep quality, weight gain due to inactivity, chondrocalcinosis (calcium crystals in the joints), anxiety, depression, deterioration of tendons and ligaments, pinched nerves in the spine, disability and reduced productivity. Like all arthritic conditions, osteoarthritis can react to weather changes: good weather can ease pain, and cold, damp weather can make it worse. Osteoarthritis patients' symptoms typically improve within 30 minutes but may be aggravated during the day with use of the affected joints. Degenerative wear and tear may affect the ligaments and musculature surrounding the elbow, resulting in chronic diffuse arm pain or pain that is poorly defined about the elbow. The TMJ may be affected by osteoarthritis, usually in those over 50 years old. Symptoms include stiffness, grating, or mild pain. Both sides of the jaw are usually involved. Extra weight contributes to the wear-and-tear and gradual breakdown of the hips, knees, and feet. There is also evidence that extra fats play a part in the degeneration of joint cartilage. Being thin or underweight permits fluid movement of the joints and means they don't take such a pounding as they do when we are overweight. Relatively few of those needing hip and knee replacements are slim. Cortisol – a hormone produced by the adrenal gland during periods of intense physical exercise – interferes with bone-building and reduces bone density by breaking down bone faster than it is made. Bone cartilage can't grow or repair itself adequately without manganese – an essential part of glucosamine, which is in turn a major joint building block. When glucosamine is in short supply, various forms of arthritis tend to arise, eventually leading to joint deterioration. Clinical studies comparing glucosamine (in sulfate or hydro-chloride form) with both placebo and standard arthritis drugs (including Ibuprofen) have shown that glucosamine outperformed both in reducing long-term pain, joint tenderness and swelling, accelerating recovery, reversing cartilage damage, and helping to restore joint function, range of motion, and walking speed. Glucosamine is a component of hyaluronic acid which has been used by injection to successfully reduce knee pain. Three years of treatment with glucosamine sulfate (1500mg per day) prevented joint space narrowing and reduced pain in two randomized, double-blind, placebo-controlled trials with a total of 414 women, including 319 of postmenopausal age. Along with glucosamine, chondroitin sulfate has become a widely used dietary supplement for treatment of osteoarthritis. Due to the popularity of the glucosamine-chondroitin supplement and the lack of reliable information about its usefulness in treating osteoarthritis [McAlindon TE et al (2000); Glucosamine and Chondroitin for Treatment of Osteoarthritis: A Systematic Quality Assessment and Meta-analysis; JAMA 283: pp.1469-1475.] the National Institutes of Health funded a study to test the effects of chondroitin and glucosamine on osteoarthritis of the knee. The control group of patients who took celecoxib (a commonly used osteoarthritis drug) did have a statistically significant improvement in their symptoms. These results indicate that glucosamine and chondroitin do not effectively relieve osteoarthritic pain. Although the study found no overall effect for the supplements, a secondary analysis of a subgroup of patients suggested that the supplements taken together helped people with more severe pain. May 19, 2008: Scientists have found that powder made from a wild variety of rosehip, Rosa canina, is better at reducing the pain of osteoarthritis than paracetamol. A review of studies, published in the medical journal, Osteoarthritis and Cartilage, looked at the effect of the powder on more than 300 patients who were given different pain-relieving medications for an average of three months. They found that rosehip was almost three times more effective than standard paracetamol at relieving pain. It was also almost 40% more effective than another common therapy, the drug glucosamine. Rosehip powder also did not have the side-effects associated with other pain medications, including constipation and drowsiness. It is believed that the powder works by also tackling the inflammation associated with osteoarthritis. Boswellin is the first herbal remedy to have documented clinical evidence that it is useful in rheumatoid arthritis, osteoarthritis, low back pain, soft tissue rheumatism and myositis symptoms. Some people have found pain relief using acupuncture. Preliminary research shows that acupuncture may be a useful part of an osteoarthritis treatment plan. Prolotherapy is the best and often only treatment when ligaments are weakened and cartilage damaged. As good as some of the other treatments are for pain, nothing seems to come close to the effectiveness of Prolotherapy. Prolotherapy is the only treatment that can stimulate the regrowth of the injured tissue. These treatments, called viscosupplementation, are administered as a course of injections into the knee joint and are believed to supplement the viscosity of the joint fluid, thereby lubricating the joint, cushioning the joint, and producing an analgesic effect. It has also been suggested that hyaluronan has positive biochemical effects on cartilage cells. However, some placebo controlled studies have cast doubt on the efficacy of hyaluronan injections, and hyaluronan is recommended primarily as a last alternative to surgery. Since 1963, evidence has been accumulating that boron is a safe and effective treatment for some forms of arthritis [Environ Health Perspect. 1994 Nov; 102 Suppl 7: pp.83-5]. Treatment plans recommended by some doctors include regularly scheduled rest. Others, however, stress the importance of continued mobility during the recovery phase, if tolerated. A clinical trial using 600 IU of vitamin E in patients with osteoarthritis demonstrated significant benefit. The benefit was thought to be due to vitamin E's antioxidant and membrane stabilizing actions. Later studies have shown that vitamin E has an ability to inhibit the enzymatic breakdown of cartilage as well as to stimulate cartilage synthesis.